The Heat Index is a measure of how hot it really feels when relative humidity is factored in with the actual air temperature. This is better explained as what the heat "feels like" rather than the actual temperature outside. Increase water consumption. Drink lots of liquids even before getting thirsty, but avoid those with caffeine, alcohol or large amounts of sugar because these can actually result in the loss of body fluid. Conduct outdoor work or exercise in the early morning or evening when it is cooler. Outdoor workers should drink plenty of water or electrolyte-replacement beverages and take frequent breaks in the shade or in an air-conditioned facility. Those unaccustomed to working or exercising in a hot environment need to start slowly and gradually increase heat exposure over several weeks. Wear light-colored, loose fitting clothing that permits the evaporation of perspiration. Do not leave children, senior citizens or pets unattended in a vehicle. A wide-brimmed hat helps prevent sunburn as well as heat-related illness. Sunscreen also protects from the sun’s harmful rays and reduces the risk of sunburn. If the house is not air-conditioned, seek accommodations in air-conditioned facilities during the heat of the day: malls, movie theaters, libraries, multi-service centers, etc. Take frequent cool baths or showers if your house is not air-conditioned. For up-to-date weather information, visit the National Weather Service Houston/ Galveston forecast office website: weather.gov/houston. 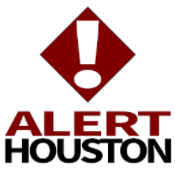 You can also follow the City of Houston OEM on Twitter (@houstonOEM) and Facebook (facebook.com/houstonoem). Copyright © 2017 City of Houston OEM, All rights reserved. Check on your animals frequently to ensure that they are not suffering from the heat. Go to a designated public shelter if your home loses power during periods of extreme heat. Stay on the lowest floor out of the sunshine if air conditioning is not available. Check the weather/listen to NOAA Weather Radio for critical updates from the National Weather Service (NWS). Protect face and head by wearing sunblock and a wide-brimmed hat. Download the FEMA App for heat advisories and safety tips. Text SHELTER + your ZIP code to 43362 (4FEMA) to find the nearest shelter in your area (example: shelter 12345). Know those in your neighborhood who are older, young, sick or overweight. They are more likely to become victims of excessive heat and may need help. Heat Wave - Prolonged period of excessive heat, often combined with excessive humidity. Heat Index - A number in degrees Fahrenheit (F) that tells how hot it feels when relative humidity is added to the air temperature. Exposure to full sunshine can increase the heat index by 15 degrees. Heat Cramps - Muscular pains and spasms due to heavy exertion. Although heat cramps are the least severe, they are often the first signal that the body is having trouble with the heat. 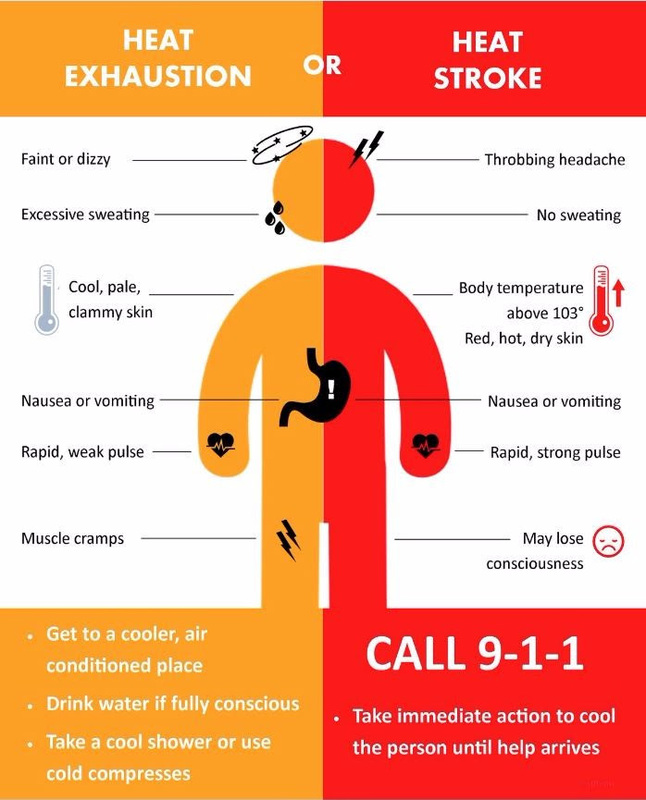 Heat Exhaustion - Typically occurs when people exercise heavily or work in a hot, humid place where body fluids are lost through heavy sweating. Blood flow to the skin increases, causing blood flow to decrease to the vital organs. This results in a form of mild shock. If not treated, the victim's condition will worsen. Body temperature will keep rising and the victim may suffer heat stroke. Heat Stroke - A life-threatening condition. The victim's temperature control system, which produces sweating to cool the body, stops working. The body temperature can rise so high that brain damage and death may result if the body is not cooled quickly. Sun Stroke - Another term for heat stroke. Excessive Heat Watch - Conditions are favorable for an excessive heat event to meet or exceed local Excessive Heat Warning criteria in the next 24 to 72 hours. Excessive Heat Warning - Heat Index values are forecast to meet or exceed locally defined warning criteria for at least 2 days (daytime highs=105-110° Fahrenheit). Heat Advisory - Heat Index values are forecast to meet locally defined advisory criteria for 1 to 2 days (daytime highs=100-105° Fahrenheit).